Lighten Up Your Home Interior With These 100% Hand-painted Canvas Oil Paintings with Signature! We at Asmork believe that modern, professional art shouldn't be confined in galleries and financially out of reach. With over 10 years in the business, our company is dedicated to supplying only high quality, professional oil paintings. Our painters have years of training and experience who reproduce all of our oil paintings by hand. You receive an original painted work with a texture you can see in the brush strokes and the blending of true colors. Its dimensions of paint ebb and flow with wonderful motions for a unique, beautiful, and eye-catching appeal. Our elegant oil painting will redefine your living style and make your home "uniquely you" no matter where you hang it. Whether it's in the living room, dining room, bedroom, bathroom, kitchen, office, bar, or patio, your room will pop with color! These 100% Hand-painted Oil Painting Sets Are Best Buy Gifts for Your Family and Friends! Since it arrives ready to hang, you can beautify and liven your wall immediately. Each painting is wrapped and stretched onto a solid fir wood frame with a hook on each panel for easy hanging. There are two sizes to choose from to fit the specific area on your wall, and each set includes THREE PANELS. Size: 14.2 x 9.4 inch x 3pcs (36 x 24cm), 28.3 x 18.9 inch x 3pcs (72 x 48cm). As each painting is 100% hand-painted, your actual pieces may be slightly different than the product image. Your oil painting is protected on the corners with cardboard, shrink film wrapped, and packed in a carton box to ensure its safety during shipping. We stand behind our oil painting by offering you a 100% money back guarantee if you're not completely satisfied. 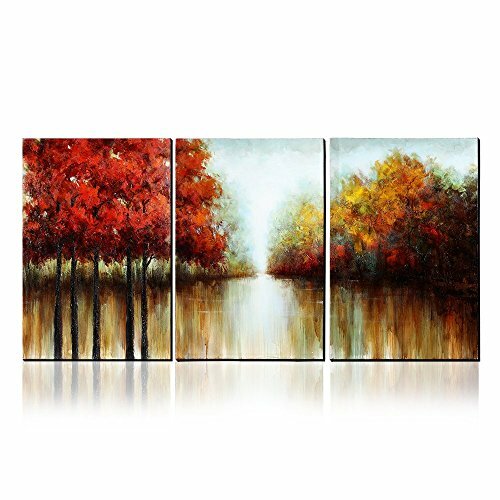 Purchase this canvas oil paintings set and instantly elevate your home interior decoration! What are you waiting for? 100% HAND-PAINTED OIL PAINTING - These fall scenery oil paintings are 100% hand-painted by professional artists for years of enjoyment. Due to each work of art is 100% hand-painted, your actual painting may be slightly different from the product image. READY TO HANG - You can hang your canvas oil painting set as soon as you receive them! Each panel is stretched and framed onto solid wood stretcher bars with a hook on each one. CHOOSE BETWEEN TWO SIZES - 14.2 x 9.4 inch x 3 pcs (36 x 24cm x 3pcs) and 28.3 x 18.9 inch x 3 pcs (72 x 48cm x 3pcs). Stretcher depth: 1.4inch. They work perfectly in the living room, dining room, bedroom, kitchen, bathroom, office, hotel, bar, or patio. WRAPPED AND PACKAGED FOR PROTECTION - We protect their corners with cardboard, shrink film wrap the entire piece, then pack it into a carton box. If you're giving these as a gift, you have peace of mind knowing they will arrive in perfect condition. BUY WITH CONFIDENCE - We offer a 100% satisfaction money back guarantee so you can buy with confidence. Get Now This Unique Set of Modern Paintings And Freshen Up Your Walls! If you have any questions about this product by Asmork, contact us by completing and submitting the form below. If you are looking for a specif part number, please include it with your message.